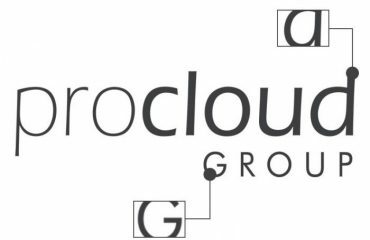 Let ProCloud Signage redesign at your real estate agency signboards to help you get stronger results. Signboards are an excellent promotional product to have in your marketing campaigns arsenal. 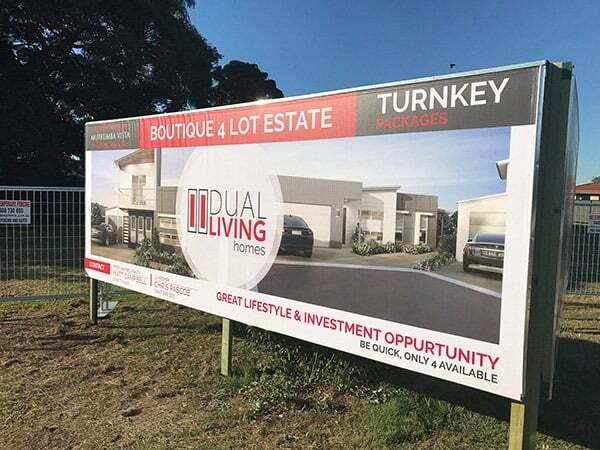 It is a large format sign & sits front & centre at the properties you have for sale. – they need to grab the market’s attention, sell the property’s attributes and also promote your brand in an instant. Whether you are an established real estate agency needing to renew your brands look and feel, or a brand new venture just starting out, getting your marketing collateral correct will be at the heart of your futures success. Unlike some other print and online marketing material, signboards pose a unique set of design challenges. With only moments to communicate your property and brand message to passing traffic, how do you make an impression? At ProCloud Signage, we designed, printed and delivered hundreds of real estate signboards, here are a few pointers on how to get the most from your real estate signboard. Nobody needs (or wants) to stand in front of a signboard and read a detailed article. Signboards are about selecting a balance of key words, essential details and striking imagery. Your real estate signboard is not just a larger version of the sales brochure; it must grab attention at a glance. Jamming in too much text is a huge mistake and will not connect emotionally with potential buyers. To create a successful signboard, you need to trigger a buyers curiosity and propels them to find out more information about; contact the real estate agent, look at the property online and then visit the open home. Some real estate agents will use QR codes on their signboards; it is a smart tactic as this allows buyers to scan and continue to walk on. 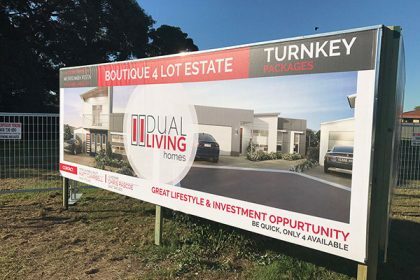 Real estate agencies need not fear white space and try to cram every part of the signboard; you can create a lot more impact with a lot less information, it lets your key message breathe and standout. Filling a real estate signboard full of content looks antiquated and damages your communication. The more successful, modern design embraces simplicity and space. We recommend using full-bleed images, combine striking hero image with a simple layout. Most people who walk past signboards will not necessarily remember the real estate agent or their contact phone number, but will almost always remember the brand – and from that, it is an easy step to look up the agents’ website. Also when driving past a signboard, you have even less time to gather any pertinent information, you will only take in any stunning pictures or key words like ‘luxury’ and the agency brand. Quality and consistency are essential to protecting your agency brand. The raw materials, including the board, frame and print quality, will all influence a potential buyer’s opinion of the property on sale and your brand associated with it. It is also essential to consider which signboard option will best suit the property you are selling. 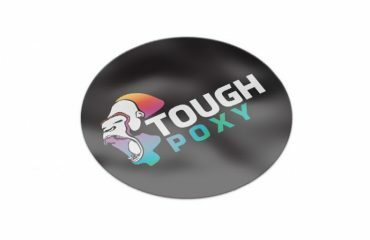 There are an extensive variety of signboard sizes and styles available, so; it is possible to find a suitable sign, whether it be displayed on a balcony or in a front yard. To maintain corporate brand consistency, many of the larger estate agencies now use design templates found online. These design templates will enforce the agency’s brand values, & ensure that the correct colours, fonts and layouts are always used. 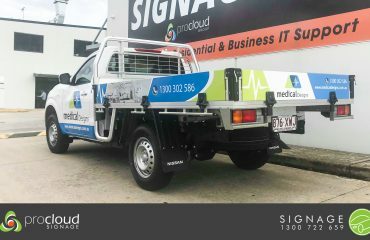 ProCloud Signage designs, prints & delivers the best estate agents signboards to real estate agencies in Brisbane. 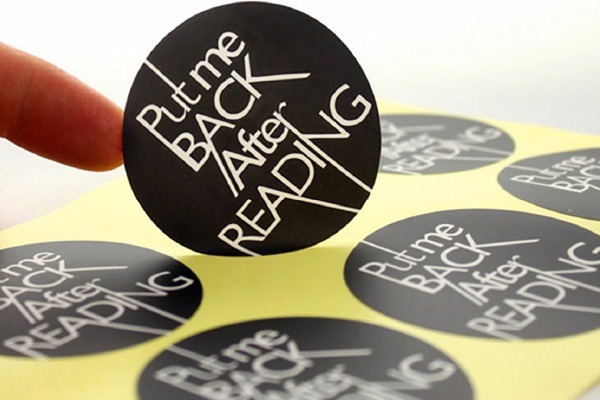 Our team of designers & printers use the latest technology & best materials to create the best signage you can get.